This format version of EpiK DrumS: A Ken Scott Collection requires that you first own the popular FXPansion BFD2 or BFD3 drum software and this acts as a sound expansion library for it. Ideal for e-Drummers and engineers who want discrete mic blending and a built-in mixing environment. This Special Edition Artist Pack contains only the drumkit (no grooves) samples from master drummer, Bill Cobham, known for his groundbreaking work with Mahavishnu Orchestra. EpiK DrumS – A......read more. This Special Edition Artist Pack contains only the drumkit (no grooves) samples from master drummer, Bob Siebenberg, known for his platinum selling work with Supertramp. EpiK DrumS &nda......read more. This Special Edition Artist Pack contains only the drumkit (no grooves) samples from master drummer, Terry Bozzio, known for his innovative work with Missing Persons and many others. ......read more. From EpiK DrumS - A Ken Scott Collection the 70s EJ Kit is a single head vintage concert tom kit recorded in the style of classic Elton John records, many of which Ken Scott recorded and produced. A k......read more. From EpiK DrumS - A Ken Scott Collection the 60s Downbeat kit is an authentic drum kit in the style of Ringo Starr and The Beatles. Complete with the distinct sound of tea towels over the toms and sna......read more. This Special Edition Artist Pack contains only the drumkit (no grooves) samples from Woody Woodmansey, drummer of David Bowie's legendary Spiders From Mars band. EpiK DrumS – ......read more. This format of EpiK DrumS: A Ken Scott Collection requires the Sonic Reality Infinite Player and with the Native Instrument Kontakt Player or full version of Kontakt. The Infinite Player is a library gateway that lets you play full Sonic Reality Kontakt libraries with just the Free Kontakt Player. The Infinite Player is included with many Sonic Reality libraries on eSoundz, or you can buy it separately with the Infinite Foundation library here. This format of EpiK DrumS: A Ken Scott Collection requires Propellerheads Reason version 4 or higher. EpiK DrumS Stereo Kits for Reason is a deluxe collection of drum kits created with legendary producer and engineer Ken Scott (The Beatles, Elton John, David Bowie, Pink Floyd, Supertramp, etc. ), and f......read more. Each Drummer Track title is like an album of songs except they are JUST drum tracks without the music! You play along with your instrument and experience a different kind of LIVE real drum performance to jam to complete with true human tempo fluctuation, dynamics, variations, fills and a wide variety of different styles of playing. Drummer Tracks Sonic Reality, makers of high end software drum instruments have put together something brand new and EASY for any musician who wants to jam along with expert played realistic drum t......read more. 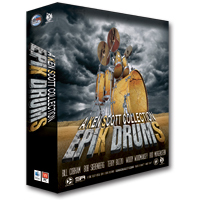 EpiK DrumS is a deluxe collection of drumkit and groove instruments created with legendary producer and engineer, Ken Scott (The Beatles, Elton John, David Bowie, Pink Floyd, Supertramp, etc.) and five iconic drummers known for their work on numerous original classic rock recordings. EpiK DrumS is designed specifically to replicate drum performances from a MIDI keyboard or electronic drumkit that offers a stunningly realistic emulation of an actual live drum session. EpiK DrumS has captured authentic vintage drum sounds from a diverse range of classic artists. Five legendary drummers: Bill Cobham, Bob Siebenberg, Terry Bozzio, Woody Woodmansey, Rod Morgenstein and the 60's and 70's kits. If you want to create drum tracks for your music that sounds like you were in a top notch studio with world class drummer, EpiK DrumS is as close as it gets. To do this type of product authentically required a lot of meticulous work hunting down the specific studios that had the right equipment to recreate the sound Ken would have gotten at Trident Studios and other places in the 60's, 70's and 80's. We had Ross Garfield, the "Drum Doctor", get us the specific drum kits to spec and we flew the drummers in to studios all over the world to have a one time reunion between the original drummer and producer/engineer so we could capture for all time their specific character drum sound as if we had extracted it right out of the album masters. All along the way we learned a lot about recording, mixing and many valuable tips from Ken Scott who in many ways was like a mentor for me. Fortunately for everyone else Ken has released both a DVD called Epik Drums EDU, an educational DVD about recording and mixing drums, and also a new book called "From Abbey Road to Ziggy Stardust" where he tells fascinating stories of his adventures in the studio working with a list of artists and bands that shaped music history. While we initially set out to create Epik Drums for sampler and loop formats such as Kontakt, Reason, Rex etc. over time more and more people requested we bring these powerful drum kit samples over to popular dedicated drum software packages such as FXPansion's BFD2. We've released individual kits from the collection to a great reception and now I'm very excited that for the first time we're offering all 7 kits in BFD format (the 5 drummer's kits plus 2 bonus kits, one that recreates the 70's drum sound of Elton John albums Ken recorded and another kit in the style of Ringo/Beatles). We have it for one great bundle price and if you love a variety of drum sounds that sit in the mix with that elusive authentic "vintage" character this is something not to miss. Check out videos of Ken Scott Collection with Sonic Reality CEO Dave Kerzner and legendary producer Ken Scott behind the scenes at the drum sessions with Terry Bozzio, Bill Cobham, Woody Woodmansey, Bob Siebenberg and Rod Morgenstein!